Status: Not obviously paired with another bird. 2016: No known nesting attempts 2017: No known nesting attempts. 2018: Didn’t nest this year, unpaired. 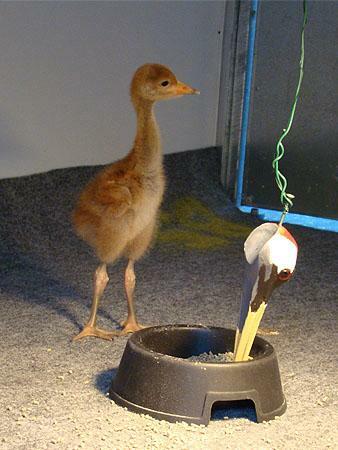 September 2012: Evie suffered with leg problems as a young chick, but grew into a perfect (although petite) crane that spent all of her time in and around the water channel at crane school . She was a very shy individual, who liked to keep to herself and was slow to integrate into the group. Her anti-social behaviour became even more apparent when a costumed 'parent' entered the enclosure, and she liked to keep her distance. This wariness could have been caused by the large amount of handling as a chick to fix her various leg problems. 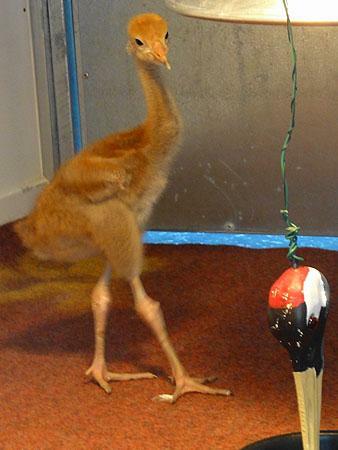 Despite her petite size, she is actually the sibling of Alexander, one of the largest birds! Once transferred to Somerset, she maintained her aloofness - keeping to herself within the pre-release aviary and rarely mingling with the others. On the day of release she refused to leave the aviary and remained there all day, and the first night - whilst all the other birds roosted on the pool within the main enclosure. The following day she finally ventured out of the aviary and after 10 mins mooching about the enclosure she took to the air and flew off, landing a little distance away. Later that day, she joined some of the older birds and was the first of this year’s cohort to roost outside of the pen - on her second evening after release! We are keeping a close eye on her - as she is truly and individual! January 2013: As autumn turned to winter, the cranes began to flock together to look for food, which they found in plentiful supply in the form of maize left in fields from the harvest. All 48 have been spending most of their time either feeding in the maize stubble or on Stanmoor, completely unperturbed by the surrounding floodwater. January 2014: 2013 was a largely uneventful and quiet year for Evie. She was always to be found in with the older birds though, rather then her own cohort. The spring and summer were spent largely on Aller Moor and West Sedgemoor, with the autumn spent feeding on the Stoke St. Gregory Ridge, and Stanmoor, and the winter flood period on pasture land on Stanmoor along with the majority of the other cranes. 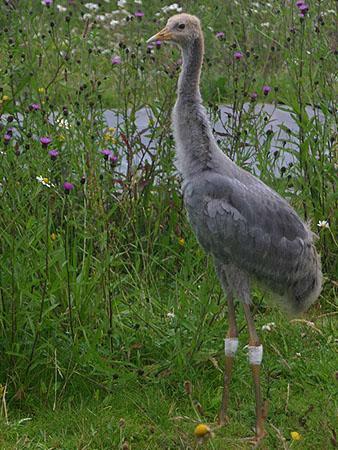 July 2015: In April 2014 Evie was one of a group of birds to fly to WWT Slimbridge and spend a few weeks on the reserve before returning to spend the summer, autumn and winter in Somerset. In spring 2015 she once again visited Slimbridge, arriving in the company of Phelps with which she is possibly paired. 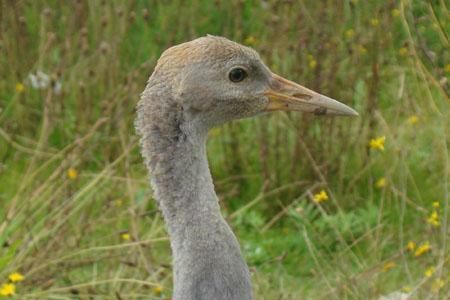 She remained at Slimbridge through April but has since gone ‘off the radar’ and we hope to get a sighting again soon. 2015 is the summer that she is due to moult, so it is possible that she is moulting somewhere and will turn up soon. February 2016: In October - Evie turned up in Somerset where she remained until December - when once again she flew up to Slimbridge. She remained at Slimbridge throughout the winter - (whereas Phelps spent the winter in Somerset) - so perhaps they're not paired? 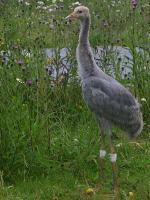 July 16: Remained at Slimbridge but there is no evidence of either pairing or nest preparation this season. She was seen to associate with Oakie and Cotton in the early part of the year before they became a pair. Nov 17: Remained at Slimbridge but there is no evidence of either pairing or nesting this season. She continues to associate with Oakie and Cotton at Slimbridge. For a successful breeding attempt this three-some will need to sort it their priorities! Sept18: Remained at WWT Slimbridge but there was no evidence of either pairing or nesting this season.